I always do a drive by of the books at Costco, it’s my treat for, well, going to Costco. I have pretty decent self-control but when I saw a hard bound edition of this book for eleven dollars and change, I was as weak-willed as a toddler within reach of a wedding cake. I wiped the frosting from my chin and checked out. I didn’t realize until I got home that I picked up the Young Adult version. Oh well. What a fantastic story. 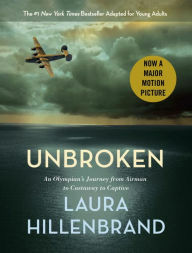 Laura does an amazing job of telling the story of Louis Zamperini as a boy and a young man, then as a WWII soldier and as a survivor. As a young boy in the 1920s, Louis was a troublemaker to the extreme. He got into every imaginable form of mischief, his favorite was stealing food. A smoker and a drunk before he was even a teen, he was very easy to write off as a juvenile delinquent; probably would have been in today’s world. In reality he was a boy with an indomitable spirit, complete with boundless energy and vitality—too much for the confines of what was deemed proper. To keep him out of trouble, Pete, his older brother, guided him into competitive running. Here was an outlet for that boundless energy, here was the attention he craved, here was that thrill he was forever seeking, here was something he could throw his spirit against. It was no surprise that he qualified for the Olympics at nineteen. WWII broke out. Instead of being drafted and dying on a beach in a standard meat shield operation, he decided to enlist and give himself options. He joined the Army Air Corps. That means that 51,000 of our nation’s young men died in accidents or plane malfunctions—the primary culprit: the planes they were flying were absolute garbage. The waste of our military men was abominable. Louis’ trial was no different, ordered to fly a rescue mission in a plane that was no more airworthy than the box a homeless person might sleep in, it was no surprise it went down. Once Louis avoided a similar situation by challenging his CO to join their mission. What follows is the most compelling and astounding survival story I’ve ever experienced. There were three survivors of the initial crash. During their forty-seven days drifting in the life raft fighting off sharks and surviving the elements, it became clear why Louis was gifted his indomitable spirit. They drifted two thousand miles to the Marshall Islands and were rescued by the Japanese. The Japanese saved the remaining two men, provided medical care, then spent the next few years torturing and terrorizing them, making the sharks look like cuddly koalas. The depth of Laura’s research is astounding, all done during a time of illness in her own life. Her writing is clear and well structured. Events flow freely in an unembellished, in an utterly compelling way. She tells Louis’ story without making it Laura’s story. I love to think critically about books, and I can find nothing to complain about—a feat, indeed. I closed this book feeling like a bit of a wuss. I like to think of myself as a survivor of sorts. I like to think I’m tough. I know now, that I don’t know. Maybe I am. Maybe I could endure torture and the dehumanizing effects of hostile captivity and retain my loyalty to to my country and fellow soldiers. Maybe, but probably not. I have not ever really suffered, not in my childhood, not in childbirth—not like so many others have. I have a renewed respect for the heroes of war and the people who fight for our country today. I am humbled. My favorite picture of Louis is one of him learning to skateboard—in his seventies.